As Blackstone’s top executives fan out across the globe, pitching their services at elite gatherings of investors, they invariably tell the crowd: Hope you guys like this hotel, because we own it. When it comes to real estate, Blackstone owns a lot more as well. The private equity firm, while better known for its huge buyouts in the deal boom before the financial crisis, is the largest private sector landlord in the United States. And that was the case even before General Electric announced on Friday that it would sell a $14 billion chunk of its real estate assets to Blackstone’s fast-growing property division as part of the conglomerate’s retreat from finance. Blackstone’s bold bet on real estate is worldwide: skyscrapers in New York and Chicago, sprawling malls and luxury hotels in Europe, Asia and the Middle East and, recently, close to 50,000 rental homes across the United States. The transaction signifies how the real power on Wall Street has shifted since the financial crisis from risk-averse investment banks to asset managers, which have been inundated with cash from investors desperate for higher returns amid super-low interest rates. The G.E. deal also crystallizes what many market analysts have come to accept as fact: Blackstone may have started out doing mergers and acquisitions in the 1980s and moved on to record-setting private equity deals in later decades, but these days the really big money is being made in real estate. For Blackstone at least, the richest of these returns have been found in real estate. Of the $272 billion that Blackstone now oversees, $81 billion is related to real estate, followed by private equity, high-yielding debt and hedge funds. Over the last two years, 50 percent of the firm’s $7.8 billion in core profits have come from what it has made from buying properties, sprucing them up and reselling them. “This deal points to a further diversification of the firm’s business model,” said Bulent Ozcan, who follows Blackstone as an analyst at RBC Capital Markets. That is actually an understatement considering the fact that about 200 real estate professionals at Blackstone (out of a companywide 2,300 people) have delivered $4 billion in cash to the firm in just two years. So it was no surprise when the chief executive of G.E.’s finance unit said last week that when the company was contemplating how it might unload its globe-spanning bundle of office buildings, shopping centers and homes in one fell swoop, only one person came to mind: Blackstone’s real estate chief, Jonathan D. Gray. 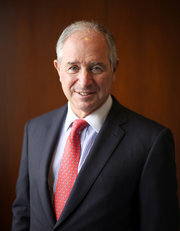 The 45-year-old Mr. Gray is everything that his larger-than-life boss, Stephen A. Schwarzman, who co-founded Blackstone in 1985, is not: Mild mannered and under the radar, he is inclined to deflect praise as opposed to absorbing it. He also trails Mr. Schwarzman in terms of the stratospheric sums that Blackstone awards its senior-most executives, though the gap is narrowing. Like Mr. Schwarzman, he has begun to spread his gains around, donating $30 million to cancer research and $10 million to the Harlem Village Academies, where he is the board chairman. Mr. Gray, who joined Blackstone as a 22-year-old analyst in 1992, declined to discuss his latest coup for this article. It seems certain, though, given the amount of money he has made for the firm, that Mr. Gray at some point will replace Blackstone’s president, Hamilton E. James, known as Tony. Mr. Schwarzman, who is 68, has not signaled that he might step aside as chairman anytime soon. In its size and scope, the G.E. sale mirrors an earlier, if not bolder, move by Mr. Gray in 2007, when Blackstone purchased $39 billion in prime office buildings from the real estate mogul Sam Zell and then flipped a bunch of the properties just before the markets turned sour. The transaction anointed Mr. Gray as a top Wall Street mover and shaker, and as his business flourished in the subsequent years, the stage was gradually set for last week’s G.E. deal. Given the amount of money and the complexities involved, the deal came together quickly. In mid-March, senior G.E. executives contacted Mr. Gray and told him that they were going to put up for sale $23 billion in real estate assets (including portfolios of loans as well as actual properties) in Australia, Mexico, Europe and the United States. Generally, a deal of this size would require a club of banks teaming up or would be done in a piecemeal manner. But because G.E. wanted to move fast, the company offered Mr. Gray and Blackstone an exclusive opportunity to examine their holdings. “We told him, ‘If you can hit this bid on an exclusive basis, it’s yours,’ ” Keith S. Sherin, the head of GE Capital, recalled in an interview with The New York Times last week. As luck would have it, Blackstone had just raised $14.5 billion (in about four months) for a new real estate fund. Having worked with G.E. in the past and being more or less familiar with the assets (at home and abroad) being offered, it was in a position to move quickly. Still, to effectively scrutinize such an asset pile in such a short period of time required seven-day workweeks and 14- to 20-hour workdays for about half the firm’s 200 real estate experts — not least, Mr. Gray himself. Inside Blackstone headquarters at 345 Park Avenue in Manhattan and at its offices in London and Asia, there was a frenzy of discounting cash flows, endless discussions via video conferences and hard-knuckled bargaining on price and other matters with their counterparts at General Electric. One person who was involved in the process referred to the four-week spring as a Wall Street version of the Bataan Death March. And while the bankers involved in the negotiations acknowledge that there were moments when it seemed that the swap would collapse, the combination of G.E.’s larger ambition to get rid of its financial business and Blackstone’s large pool of ready capital got the deal done. Blackstone would end up buying $14 billion of assets, split among three funds and its real estate investment vehicle, Blackstone Mortgage Trust, which as a result doubled its asset base to about $8 billion. Wells Fargo in California bought $9 billion in real estate loans. Other parties brought the total of General Electric real estate assets to be sold to $26.5 billion. More than four years after real estate prices bottomed in the United States, this deal may come to be seen as a sign of another top, especially with higher interest rates foreseen in the months and years ahead. In past public statements, Mr. Gray has said that real estate has indeed had a good run. But he has also pointed out that he has seen no evidence of too much capital and too many cranes — the sign for him that markets are overheating. Posted on April 13, 2015, in Postings. Bookmark the permalink. Leave a comment.